Good morning everyone :). Can you believe the week is already half over? AND we're already a week into November?! Crazy. But anyways, I'm here today to share with you a girly layout that I put together for Manor House Creations, featuring plenty of their brand new Spring Collection! My little girl is ALWAYS on the go- and often, these are the pictures I end up with of her! So I tried to convey that movement with my flowers stretching across the page. I started with the beautiful “Winter Song- Embers” flower from the Winter Collection as my centerpiece, and worked on clustering from there. These larger florals work GREAT for setting the stage of any cluster! I’ve misted the “Springtime- White” flower in the bottom left corner with some light purple mist to add just a little more color. I’ve also applied some pink mist here to the “Springtime- White” flower. They really do take well to altering! 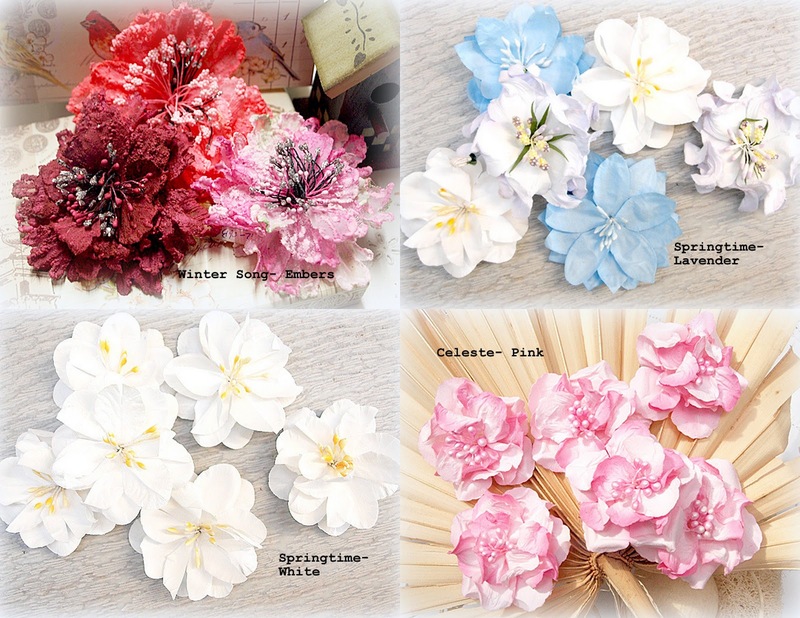 MHC Products Used: Winter Song- Embers, Springtime- Lavender, Springtime- White, Celeste- Pink, Leaves. You will definitely find plenty of fun, fresh colors in the Spring Collection- have you had the chance to check all of them out?? If not, head HERE and have a look! You will NOT be disappointed! Thanks so much for stopping by! I hope you have a great day and we’ll see you again soon! Pragtfuldt LO med din lille pige i trav, og dit blomster valg er så overdådigt flot, og passer til farverne i LOet: skønt syn. knus morkaren. Wauw!! I love all the flowers and the lovely colors. It's so lovely!! Erin firstly thank you for visiting my blog, I was so excited to see a comment from you because I admire your work so much. This page is full of 'springtime' with all of those gorgeous flowers and the photo is just so sweet. Gorgeous! I love the pink on the blue and that flower cluster is drool worthy! Those flowers are gorgeous. Love the raised masking. So pretty! Gorgeous work as always Erin, those blooms are stunning too! adorable page with beautiful flowers! It seems like you just had her! Those photos are too cute, Erin!! LOVE how you used those gorgeous flowers on a diagonal design. Such a beautiful, girly page!! Wonderful layout! Love all the flowers! So very pretty! Love the sweet photos and all the beautiful flowers! Lovely! The movement of the flowers across the page sorta mimics your DD's movement!! Very clever:):)) And those flowers...sigh....what can i say???!!!!!!!! Love the run of flowers and the photos inbetween. Gorgeous page. HI..This is stunning... all those flowers look so pretty! 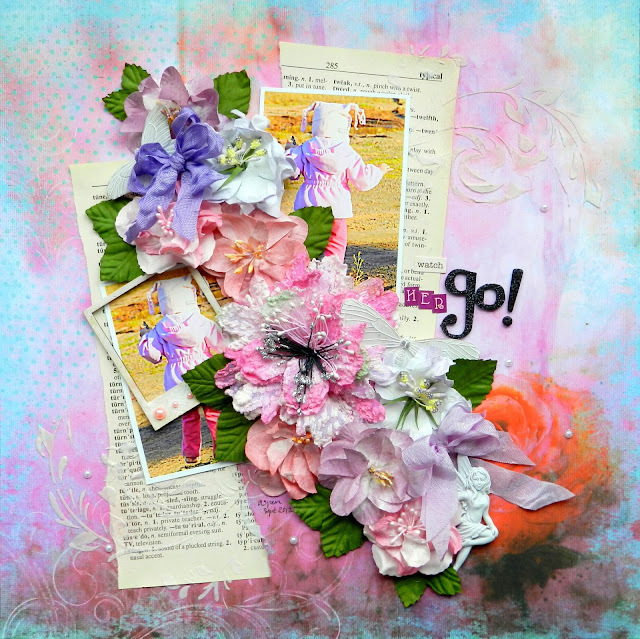 gorgeous, I love how the flowers cascade down the page and the torn book page is a cool accent, and of course Aspen on the go is too cute! This turned out really pretty love how you used those bloom! Lovely and colourful and that photo is just the cutest! !